Prosecutors in the Netherlands have formally charged a Dutch businessman with complicity in genocide for selling chemicals to Iraq's former regime. Frans van Anraat, 62, is accused of selling US and Japanese chemicals which were used to produce poison gas. 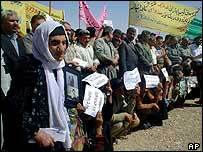 The gases are said to have been used to kill more than 5,000 in a 1988 attack on the Kurdish Iraqi town of Halabja. Mr van Anraat earlier admitted selling chemicals but told Dutch TV he had not known what they would be used for. The full trial of the businessman - the first Dutch national to be prosecuted for genocide - is not due to start until November. Evidence being used by prosecutors includes information obtained from the former head of Iraq's chemical weapons programme, Ali Hassan al-Majid, otherwise known as Chemical Ali. He has been charged in Iraq of masterminding the mustard gas attack on Halabja for which Saddam Hussein also faces charges. Frans van Anraat listened to the charges on Friday in the Rotterdam courtroom in the presence of four survivors of the Halabja attack, each of whom are demanding more than $10,000 (7,513 euros) in damages. 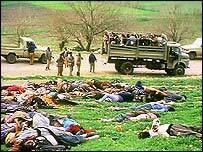 The images of the gas attack on the Kurdish city Halabja were a shock. But I did not give the order to do that. The atmosphere in the courtroom was sombre as a prosecutor read them out, the BBC's Geraldine Coughlan reports. The prosecution said there was a direct link between the injuries of two victims and a chemical substance known as TDG, allegedly supplied by the businessman. "Van Anraat was conscious of... the fact that his materials were going to be used for poison gas attacks," said prosecutor Fred Teeven. "The damage and grief caused will not be rapidly, if ever, forgotten." Mr van Anraat is charged with supplying thousands of tons of raw materials for chemical weapons used in the 1980-1988 war against Iran and against Iraqi Kurds. According to prosecutors, the United Nations has described Mr van Anraat as "one of the most important middlemen in Iraq's acquisition of chemical material". His defence lawyers said there was no convincing evidence linking the material supplied by Mr van Anraat and chemical weapons used by Saddam. 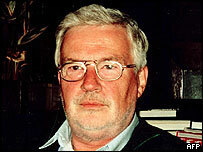 In a 2003 interview, Mr van Anraat denied being aware of the attack. "The images of the gas attack on the Kurdish city Halabja were a shock. But I did not give the order to do that," he told Dutch magazine Revu. "How many products, such as bullets, do we make in the Netherlands?" One of the survivors in court, Karwan Abdula, told AFP news agency that the arrest of van Anraat "was nearly as important as the arrest of Saddam Hussein". Prosecutors say the Dutchman had been a suspect since 1989, when he was arrested in Milan, Italy, at the request of the US government. But he was later released and fled to Iraq, where he remained until 2003. During that time, reports say he fed information to the Dutch intelligence agency on Saddam Hussein's weapons programme. After the US-led invasion of Iraq in March 2003, he returned to the Netherlands and was arrested in December 2004 at his Amsterdam home. The UN suspects he made 36 separate shipments of chemicals via the Belgian port of Antwerp through Aqaba in Jordan to Iraq, the prosecution says. At Friday's hearing, judges rejected a request by Mr van Anraat to be provisionally released pending trial - to applause from the public gallery.